Grand opening of the Gazing Gazebo at the Duck Pond made possible by generous donors. Outstanding Support from the Royal Canadian Legion to meet the Priority Needs of Veterans. Team Perley Rideau was the 2018 Kichesippi Workplace Run-off winner. The Team raised over $21,700. Bill is sharing a laugh with PSW Supervisor in his room. Sponsored by generous donors, the Summer Youth Summer Volunteer Program provides students with opportunities to volunteer and improve residents' quality of life. The Perley Rideau Tree of Life is a beautiful way to remember a loved one, to honour someone or to celebrate a special life event. The Perley Rideau Foundation Donor Wall. Over 600 seniors and Veterans living life to the fullest thanks to generous donors like you! 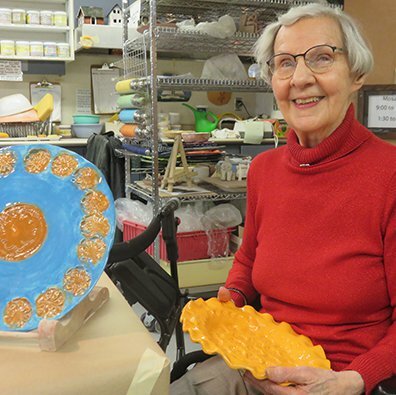 Your donations have enhanced our Therapeutic Recreation and Creative Arts Program and Volunteer Services. We have also purchased new much needed equipment such as furniture, small appliances and dental care equipment, to name a few. Edith Goodspeed pauses, overcome with emotion, as she thinks back to the young men who were injured or killed on the Second World War battlefields. “The boys were ours. They were wonderful kids,” she said. The Nepean Kings know what it means to have great sportsmanship on and off the ice - and they're demonstrating that with the relationships they're forming with Veterans at the Perley Rideau. Join your friends and colleagues in raising money for the Perley Rideau while running in Canada's largest marathon! All funds raised will go to support the Priority Needs of the Perley and Rideau Veterans' Health Centre Foundation. frailty informed care and service. The Perley and Rideau Veterans’ Health Centre is an innovative Seniors Village with 450 long-term care beds and 139 independent-living apartments. Veterans enjoy priority access to 250 of the long-term care beds and to the apartments. A growing number of clinical, therapeutic and recreational services are available on-site. © 2019 The Perley and Rideau Veterans’ Health Centre Foundation. All rights reserved.